Hot Toys’ latest masterpiece is a faithful replica of the ED-209, which serves as RoboCop’s foil in the movie franchise. 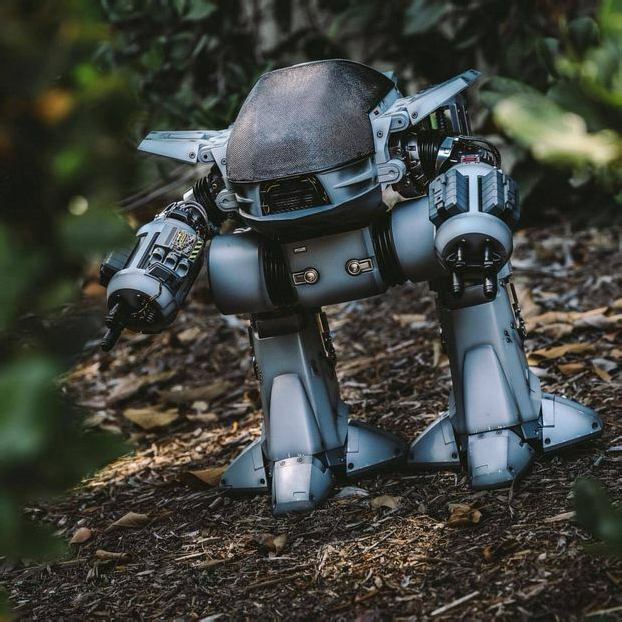 The law enforcement droid is one of the RoboCop universe’s many complicated and intricate character designs, making it the perfect playground for Hot Toys’ detail-oriented wizards. This 1/6 scale figure stands nearly 14 inches tall and features a newly-sculpted body that nails down every weapon, joint, nut, bolt, vent, and wire. 25 points of articulation perfectly simulate the movement of the droid. But it’s not all visual; the figure is also equipped with sound effects directly from the silver screen. Continue reading for a full primer on its features. The box contains interchangeable arms: one left machine gun-equipped arm, one right machine gun arm with a rocket launcher, and one left battle-damaged arm. Also included is a remote control that triggers the three sound bytes.